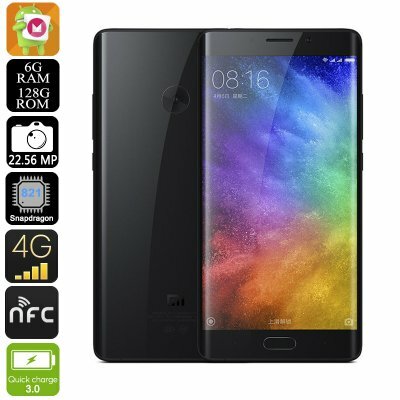 Successfully Added Xiaomi Mi Note 2 Smartphone - Snapdragon 821CPU, 6GB RAM, 128GB Memory, 22.56MP Camera, 4G, NFC, Quick Charge (Black) to your Shopping Cart. Xiaomi is making waves with its recently launched Mi Note 2 that features a 5.7 inch OLED display and 3D curved glass construction for a premium look and feel. Boasting an impressive 77% screen to body ratio the Xiaomi Mi Note 2 Android smartphone is a stylish combination of glass and aluminum. With 5.7 inches of full HD display it ranks as a phablet phone and offers a large display that is perfect for surfing the web, playing games and watching media. Rocking the latest Qualcomm chipset, the Snapdragon 821, and with 6 GB of DDR4 RAM the Xiaomi Mi Note 2 has a monstrously powerful performance that is nothing short of spectacular. If you're looking for a fast smartphone for games or intensive use then the Mi Note 2 can certainly fill that role. This 6GB version has 128GB of storage space which removes the need for removable storage and should be ample for even the heaviest of users. With the MIUI 8.0 operating system, based on Android 6.0, you can enjoy all the perks of Android with additional customization options for a truly personalized user experience. Quick charge 3.0 technology has been incorporated into the phone allowing the 4070mAh battery to be recharged quicker than ever before. This means that running out of power won't be a problem and when you do need to recharge it will spend much less time plugged into the wall so you can enjoy greater freedom. The optics on this phone are downright stunning as it uses Sony's new 22.56Mp Exmor RS sensor and with the 3 axis gyro sensor you can get smooth video recordings up to 4K as well as take stunning low light shots. For connectivity this Android phone gets 4G support with frequencies FDD: B1/2/3/4/5/7/8, TDD :38/39/40/41 covered. This allows for the fastest cellular data plans across much of the globe. The Xiaomi Mi Note 2 Android smartphone come with 12 months warranty, brought to you by the leader in electronic devices as well as wholesale Android Phones..